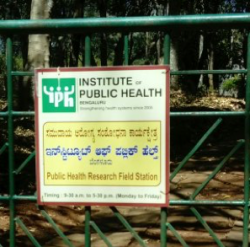 In February 2019, SASHI team members visited the IPH field station at BR Hills, Chamarajanagar district (Karnataka) to discuss research collaboration. The Institute of Public Health, Bengaluru (IPH) is a premier institute for training and research in health systems in India. IPH’s research work has focused on identifying equity-oriented and health systems based research questions. Dr. Prashanth N Srinivas heads IPH’s health equity cluster. He has research interests in health policy and systems research, health equity, OneHealth, and mental health. He was till recently the Chairperson of Emerging Voices for Global Health, a thematic working group of Health Systems Global. Almost 9% of India’s population is made up of tribal communities. They have poor access to healthcare and poor population health outcomes like maternal and child mortality and morbidity, communicable disease prevalence and nutrition, and chronic diseases. Among the social determinants of tribal health, geographical remoteness, proximity to forest areas, cultural distance from the “mainstream” population, historical isolation and social stratification have all been postulated to have a significant effect on their health outcome. The health equity cluster works with forest dwelling tribal communities (also known as Adivasis, indigenous communities), on improving their access to healthcare services. The network brings together individuals and institutions interested in advancing health equity through research, advocacy and action. 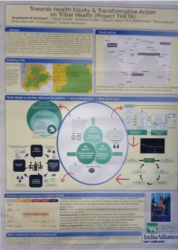 The network was an outcome of the “Closing the ga p: Health equity research initiative in India” by the Achutha Menon Centre for Health Science Studies, Sree Chitra Tirunal Institute for Medical Sciences & Technology, Trivandrum. The health equity cluster is the national secretariat for the network. Achieving equitable health involves action not only on various aspects of human health, but also acknowledging and ensuring cross-sectoral action and inclusive inter-disciplinary engagement across public health, animal health and environmental health professions and disciplines. In view of its work in forested areas, the health equity cluster focuses on health systems strengthening components in OneHealth initiatives. They are involved in the MonkeyFeverRisk project, a Indo-UK project that develops innovative inter-disciplinary frameworks to help communities avoid exposure to zoonotic diseases whilst maximising the livelihood benefits they derive from tropical forests. Their current focus is on the emerging tick-borne viral infection Kyasanur Forest Disease (KFD) that affects low-income communities in the Western Ghats forest in India. It is impossible to conceive an idea of health without ensuring and realising the mental health of the population. Yet, this is among the most neglected of health problems in terms of access to care for mental health conditions globally. The health equity cluster focuses on research and action for strengthening mental health in primary health care. It is in relation to mental health and suicide that the work of IPH and SASHI mainly coincide. Understanding the incidence and prevalence of self harm in the Adivasis community and understanding the pathway to receiving care for these issues is a key factor. It is likely to be very different from the urban pathways which are being examined by the SASHI project in Mysuru. In addition, we share a mutual interest in social factors contributing to ill health, limited access to services, self harm and suicide. We are sharing research ideas in respect of social inclusion, social capital and social networks in the locality. The first step, as undertaken in the UK and in Hong Kong and Brazil might be to see to what extent these concepts ‘travel’ by conducting concept mapping exercises, with indigenous helpers. If this work can be developed then it will be another important output for the SASHI project and an extension of research collaboration.